The authors emphasize that they do not believe it is mere coincidence that the areas (the northeastern region of Pernambuco state) where the Brazilian government added pyriproxyfen to the drinking water supply in 20143 are the same areas in which the vast number of microcephaly cases have been detected. 1 Avila Vazquez M and Team REDUAS. 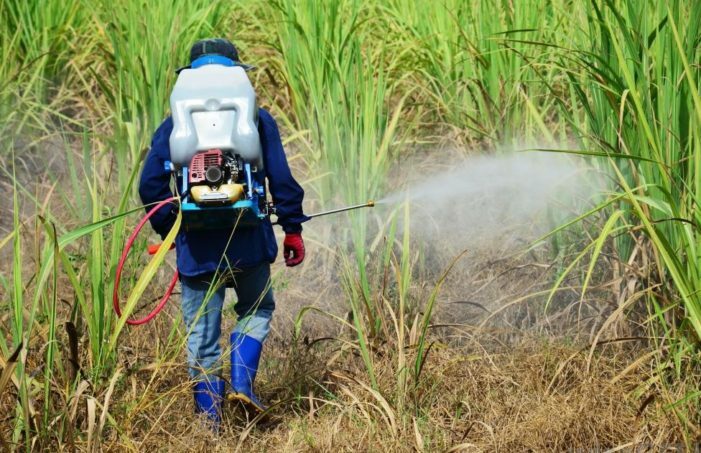 REPORT from Physicians in the Crop-Sprayed Villages regarding Dengue-Zika, microcephaly, and mass-spraying with chemical poisons. Red Universitaria de Ambiente y Salud Feb. 3, 2016. 2 Ritterman J. Monsanto’s Roundup Linked to Cancer—Again. Truthout Oct. 6, 2014. 3 Robinson C. Argentine and Brazilian doctors suspect mosquito insecticide as cause of microcephaly. Ecologist Feb. 10, 2016. 4 Robinson C. Zika or Insecticide Pyriproxyfen Behind Microcephaly Cases? The Freedom Articles 2016. 5 Reis V. Nota técnica sobre microcefalia e doenças vetoriais relacionadas ao Aedes aegypti: os perigos das abordagens com larvicidas e nebulizações químicas–fumacê. ABRASCO.org Feb. 2, 2016. 6 Ma W, Li X, Dennehy TJ, Lei C, Wang M, Degain BA, Nichols RL. Pyriproxyfen resistance of Bemisia tabaci (Homoptera: Aleyrodidae) biotype B: metabolic mechanism. Journal of Economic Entomology February 2010; 103(1):158-65. 11 Responses to "Pyriproxyfen Suspected of Causing Microcephaly in Brazil"
It figures, and lines right up with other existing theories that all uses of chemicals have unintended consequences. That’s why we use a Berkey water filter, because farm run off is a serious concern for many residents who’s municipalities serve up surface water, rather than well water, via municipal supply lines. Does your water come from well or surface in your county, to your home and/or work? You should know these things, and filter with gravity and ultra micro filters accordingly. Another story illustrating lack of clean drinking water is to blame. Sounds more realistic than blaming mosquitoes. The consequences are not ‘unintended’. “Mistakes” is the cover word constantly used to disarm the public. If these bureaucrats and ‘experts’ are such freaking experts, how can they make so many ‘mistakes’? Amazing what happens when someone does a little digging and ends up debunking a theory being manipulated into an world epidemic emergency demanding a vaccine for a little known viral infection that expresses itself as mostly mild flu-like symptoms and with no symptoms on over 80% infected. Big Pharma is readying an emergency vaccine in an effort to make another few $Billions from the resulting panic. Microcephaly is certainly a concern, but lets find the real cause for it and address it without endangering any others with an non-needed additional vaccine. Yep. I commented on that in the other weekly nvic article. With attention focused on Brazil for the Olympics, we’re learning how awfully polluted the land and living areas are. All anyone needs to do, to ‘discover’ problems there, is lift the blindfold, and actually look. Unfortunately (or maybe not so unfortunately at all) the most logical explanation will not be researched and followed-up on: This so-called “new epedemic” started in Brasil in May 2015. In October 2014 the Brasilian Health Department started vaccinating pregnant women with the Tdap vaccine Boostrix from GlaxoSmithKline (GSK), a British vaccine producer. Anybody who is not only sucking up the pro vaccine propaganda and just delves into the matter a little more thoroughly knows how dangerous vaccines really are especially to pregannt women and the fetus, but the money for industry, science, doctors and other interested parties is mindblowing and too tempting. Don’t expect anybody – especially not the WHO or Bill Gates Foundation – to follow up on this trail, it is so much more “enriching” to put the blame on a virus and develop a new vaccine. Questions: when pyriproxyfen was introduced to the US, was it added to the water supply? Was there an increase in birth defects in the US when it was introduced? And does anyone know if microcephaly or other unusual birth defects have been found in the young of other species in the affected region of Brazil? Thinking about vacines…out of date…from Cuba…? unfortunately I do not speak Spanish. Do you know if this articale could be had in English or maybe you could just give me a short translation, the main points what it says. I know that studies are manipulated in order to “prove” that under no circumstances vaccination could be the culprit. Also I read an article that a couple of months before this illness came to their attention a genetically altered moscito was let loose in Brasil. I am sure I could find the article but maybe somebody mentioned it already, I just don’t have time to read all the comments again. So if you want more information I will look for the article. Those two points (vaccination and/or genetically altered moscitoes) make a lot more sense to me than some virus that exists for centuries and never were a problem. It makes more sense that some sort of chemical or pesticide would be the culprit of the high incidence of microcephaly in Brazil compared to a mosquito bite. It’s not surprisingly that the Japanese maker of the chemical is aligned with Monsanto, the top dog of causing mayhem on our beautiful planet. The level of greed is so out of control with companies like Monsanto and the Big Pharmas that humanity is being bombarded at every turn with some kind of event that pushes the masses in a corner of fear which leads to higher profits as the masses move on that fear and adopt the recommendations of those who are on the payroll of those greedy companies. It’s a classic case of (Problem ~ Reaction ~ Solution) they create the Problem, wait for the public Reaction, then offer the Solution. Pyroproxyfen is manufactured by Sumitomo Chemical, long-term strategic partners of Monsanto (enough said). These are CRIMES AGAINST HUMANITY and these Scumbag Chemical Companies need to be held accountable for their actions.